If you’ve ever been in a Canadian university or college town or even a big city on a weekend night, roughly around 2am, then you’ve probably been witness to a new phenomenon of city night-life. Where there are young people, there are clubs and bars. Where there are bars and clubs there is always some kind of greasy fast-food joint endeavoring to make a few bucks off tipsy 20-somethings on their way home. In Toronto, one of the hottest spots to be after a night out and about is Smokes Poutinerie. Hordes swarm towards the red and black plaid signs. How did they become so popular? Stickers with logo and social media. Smokes Poutinerie is a fairly new addition to the great city of Toronto, but it has certainly been a welcome one. Owner Ryan Smolkin started with one operation in Toronto a little over two years ago, but has since expanded his chain to a national operation with 10 franchises in Ontario alone. What is particularly interesting about this is the marketing tactics Smolkin used to gain notoriety and publicity and to get people to try his products. No print ads or commercials were ever produced; instead he used social media and stickers. Smolkin deftly created a following on Twitter and Facebook, but his creative guerilla marketing tactics are what really created a buzz in Toronto. 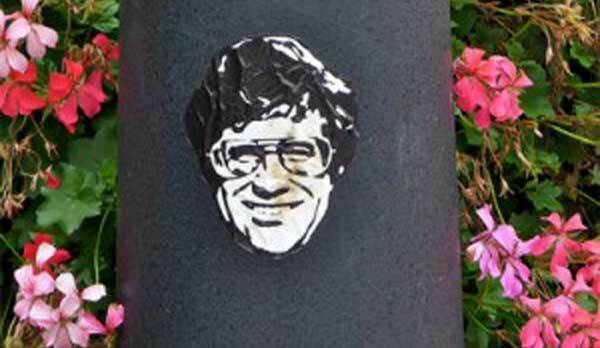 The Smoke’s Poutine stickers are fairly simple; a black and white 80’s style sticker that depicts a face. The stickers are non-descript and do not even include the name of the restaurant or a website. But they were memorable, and they were everywhere- inciting interest and sparking curiosity. Smolkin once commented in an interview that he built his cheese and gravy empire all by spending hardly anything on advertising. Social media tactics were free and the stickers cost less than 10 cents per sticker to make and $10 an hour to hire someone to sticker bomb the city. Then once the word was out, it snowballed. Frequent diners of Smoke’s Poutinerie would take stickers and adhere them wherever they went, further promoting the business. Find them in city cores, campus parks, on street signs, in public washrooms, inside textbooks, on the outside of streetcars, and many more places. You can’t walk through Toronto today without passing at least a couple of those familiar sticker-faces. This is just one example of sticker marketing at its best and the success that can come from a little creative advertising.